I am pleased, excited and terrified to announce that Yet Another Podcast will be launching on September 20, 2010. This is not your momma’s podcast. Don’t Waste The Lister’s Time: The shows run as long as they take. No fixed format. Count on something between 20 and 40 minutes, except when they are longer or shorter. Don’t Waste The Listener’s time: Useful information or shut up. The show will be posted every other Wednesday starting on September 22. I’ve been honored to be on his 2nd show. 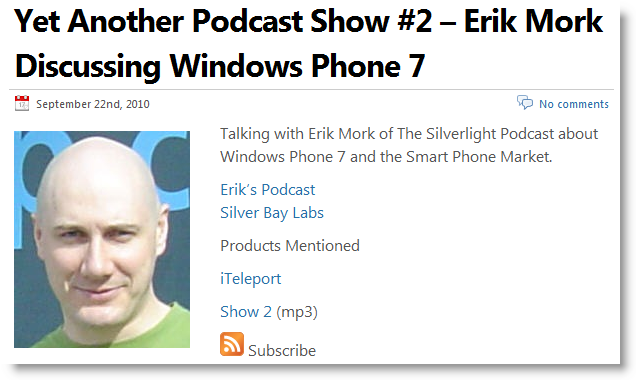 We talk about Windows Phone 7, iOS and marketplaces. Microsoft has a history of colossal successes and failures. 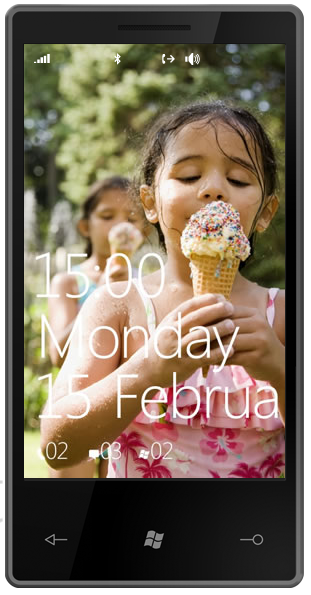 As the Windows Phone 7 release approaches, it’s sure to be big (reports say the marketing alone will be a $400 million affair), but will it be a success? Early reviews are positive, but can a company miss the mobile boat by 3+ years and still make a competitive product? Adam Kinney and Karl Shifflett talk about developer/designer workflow in Portland! *- assumes you use the MSDN subscription to start your own company and write something awesome. Warning: We won’t be 20 seconds into this session before mashing the gas pedal to the floor. After looking at the XAML tools Blend & Cider, we’ll dive deep into toolable application design. Toolable applications not only enhance the initial development experience but also provide benefits to long term application maintenance. An additional benefit is the enabling of the designer developer workflow. See the two roles played out in the presentation as they collaborate without clobbering each other. Karl Shifflett is a Program Manager at Microsoft working on the WPF and Silverlight Designer since August of 2008. Before Microsoft, Karl was a software architect, former Microsoft MVP and Code Project MVP. He has been designing & developing business applications since 1989 and transitioned to .NET in March of 2003. In April of 2007 he joined the list of WPF fanatics & evangelists. He is a member of Team Mole that delivered the Mole Visualizer for Visual Studio to the world. He is the author of the very popular XAML Power Toys; loves WPF and Silverlight LOB and is developing a passion for Windows Phone 7 and ASP.NET MCV. You can read his blog at: http://karlshifflett.wordpress.com/. Adam Kinney is a creative developer with a strong focus on UI technologies including HTML, CSS, Canvas, Processing, Flash, WPF and Silverlight. He enjoys working in the space between design and development teams enabling the best results from both sides. Having spent the last five years as an Evangelist for Microsoft, Adam also enjoys sharing his knowledge and helping others learn new UI technologies and tools. Recently leaving Microsoft, he is currently working on a variety of interesting projects and experiments with the crew at Pixel Lab and posting tutorials on his personal site:http://adamkinney.com. Vertigo – Vertigo is an award-winning design and development firm that uses the latest Microsoft technologies to redefine the user experience for the Web, mobile and multi-touch environments. Vertigo develops rich media solutions such as Silverlight Deep Zoom image galleries, HD on-demand and live-streaming videos and social media integration. Webtrends – Webtrends helps you turn the data generated by your web site, blogs, online campaigns and enterprise systems into understanding of your customers and business opportunity. Intel – They make cool stuff. I’m giving a talk tomorrow! Are you interested in what Silverlight is and what it can do? How does it compare to HTML 5? 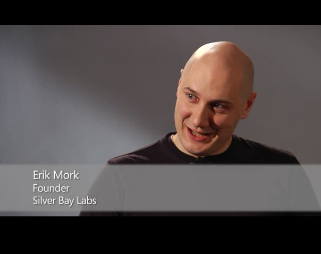 These questions and more will be answered by Microsoft Silverlight MVP Erik Mork. 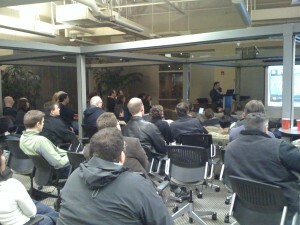 It’s going to be a fun night of info for Silverlight beginners. Also not to be missed: a Silverlight Ninja will be designed before your eyes. I was interviewed by Tim Huckaby for the great MSDN Bytes Series. It’s a super fun interview where he asks me what it’s like to be a Silverlight Trainer and Consultant. Tim’s one of the best interviewers in the business, and his series is a pleasure to watch. Interested in what happened at Mix? Want to hear about the new phone? This month, we held off the Portland Silverlight User Group meeting for the Mix conference and boy are we glad we did We’re going to have a low-key meeting in the new Lucky Lab and talk about the developments. Do you write Silverlight or XNA? If so, you just became a phone developer. Join us to help figure out what that means. People from Mix will be talking about what they learned and how the world has changed. Erik is in Minneapolis teaching the Silverlight Tour class. Interested in a Nerd Dinner tonight (Monday 3.1.2010)? We’re meeting at Schuller’s Tavern in Golden Valley at 6pm. There’s going to be a Nerd Dinner tonight 2/23 at 6pm. We’re going to meet in the food court at Pioneer Place Mall (bottom floor – http://www.pioneerplace.com/). Erik Mork/Kelly White – Portland Silverlight User Group/Sparkling Client folks. Jason Mauer – Newly independent developer. Hopefully, he’ll bring his new “Troll Video” he plans to show at Ignite Portland. I’ve got to stop by the Genius Bar shortly before and get the lint cleaned out of my iPhone. Do you have questions about Silverlight? Shawn’s the person to ask. He’s full of Silverlight knowledge, and he’s coming to Portland to have a conversation with us. Shawn is extremely well known and respected in the Silverlight community, and it’s going to be a real treat to have him. If you want to have a complex and nuanced discussion about Silverlight, join us for this meeting. Shawn Wildermuth is a Microsoft MVP (C#), member of the INETA Speaker’s Bureau and an author of six books on .NET. Shawn is involved with Microsoft as a Silverlight Insider, Data Insider and Connected Technology Advisors (WCF/Oslo/WF). He has been seen speaking at a variety of international conferences including SDC Netherlands, VSLive, WinDev and DevReach. Shawn has written dozens of articles for a variety of magazines and websites including MSDN, DevSource, InformIT, CoDe Magazine, ServerSide.NET and MSDN Online. He has over twenty years in software development regularly blogs about a range of topics including Silverlight, Oslo, Databases, XML and web services on his blog (http://wildermuth.com). At the beginning of the meeting (6pm), Marc Schulper will show us how to write Silverlight applications for a web based operating system. Trimet. I recommend taking Trimet to this event. Check out the map to see the tons of Max/etc. stops nearby. 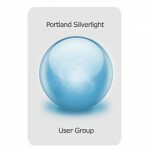 The Portland Silverlight User Group is off to a great start! It’s been an amazing group to be a part of, and for the first 2 meetings, we’ve had 70+ people. 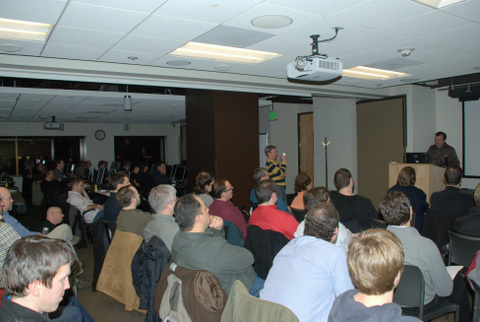 This, perhaps, makes the Portland Silverlight User Group the largest Silverlight UG in the world We’ve had rocking great speakers like Scott Stanfield and Mike Downey and stupendous sponsors amazing sponsors like Vertigo and Webtrends and FiServ. Upcoming we have a hackathon in January and Shawn Wildermuth coming in February! People are talking about how 2010 is going to be the year of Silverlight. Come to one of our meetings, and you’ll find out what the fuss is about.